The ship took off on its second test flight on August the 24th 2016, it performed perfectly on its flight, on landing there was an issue with the mooring gear, a fault with the equipment that needed fixing, as this work was going on the ship, now sitting on the ground was Superheating, Super heating is when the helium inside the envelope is heated by the sun, this starts to increase the lift of the helium, on that warm August day Airlander was getting lighter and lighter and the captain thought it best to take off and circle the airfield whilst the ground crew sorted the equipment, as the ship took off the 150ft long mooring line had not be put back in its storage area and was left hanging down, a lot of airships have these lines but Airlanders is a very long one. The ship took off and made a circuit, on her run in for her second landing the 150ft mooring line clipped a power line that crosses the perimeter of the airfield, this in turn knocked out some local houses electric but had no effect on the ship, she carried on but a lot higher now because of this mooring line and the risk of snagging it on some of the surrounding hedges or trees round the airfield. the ship came in and the pilot tried to bring her lower and lower, the ship had been super heated and especially after her initial long flight was quite light at this point. 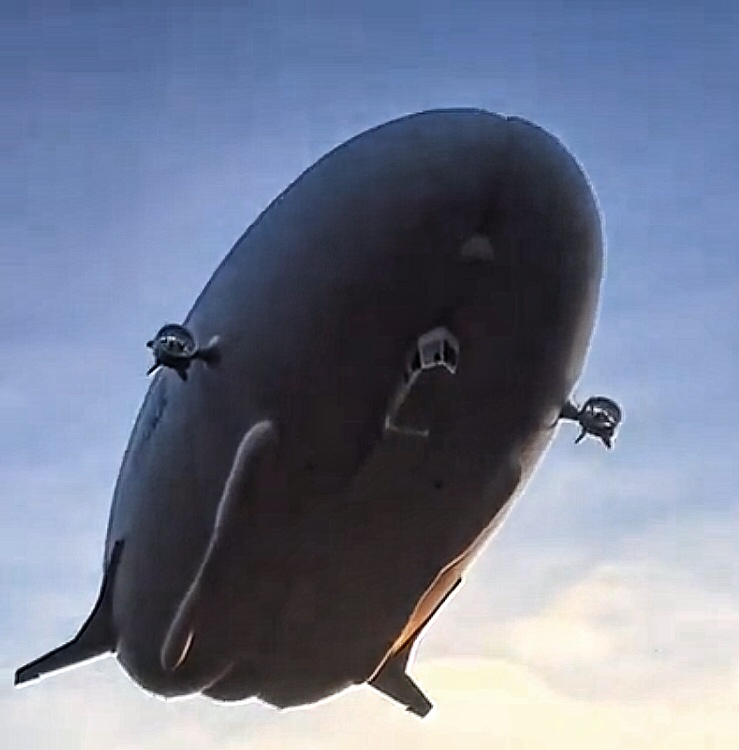 AirLander is designed to land gently sweeping in and coming to a halt on her air inflated skids, not as they were trying to do and bring her down from a high position, they however had no choice but to attempt this type of landing due to the mooring line hazard, as the pilot tried to bring her nose down so the crew could grab the mooring line she took a steeper and steeper dive, coming down very slowly nudging the forward flight deck into the ground, the pilot and co pilot were unharmed but the flight deck was pretty smashed, if the ship was 50 odd ft higher at the start of the dive she probably would have leveled out and made a very fancy looking landing, on an animation i have made with photos taken by a freind who was there you can clearly see on the frame before impact the tail start to move down. if the ship had started the decent lower it would have hit hard on the skids but the flight deck would have been fine, it sadly was in the sweet spot for a ground impact of the gondola. HAV the next day brought the ship back to shed 1 and the ship has been there ever since undergoing repairs, these repairs are almost complete but they have also added other safety features developed from the lessons learned from this very accident, the most obvious being the new Auxiliary landing skids just forward of the gondola, these will deploy if in the future the ship is ever found itself in a severe nose down position, the skids will deploy and the ship will land on those and then level so the flight deck will be protected, another feature is the mooring line is now retractable by the flight crew during flight removing this risk from future flights. as of writing it is said the ship should be back out at the end of this month, March. resumption of test flights is due beginning of April.